Parents at Springfield Housing Authority’s Duggan Park Apartments lined up to register for Talk/Read/Succeed! 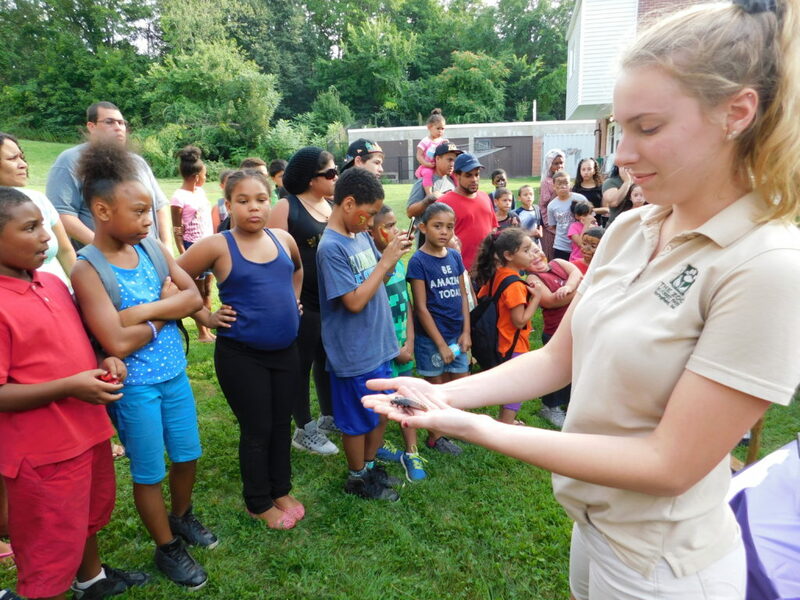 while their children did fun things like play a literacy roulette game and see and learn about live, exotic animals, among other things. 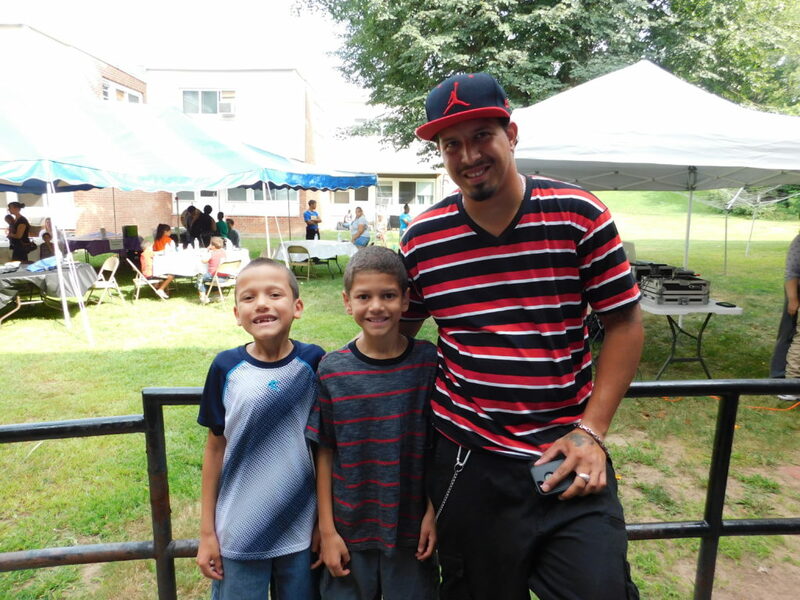 Johniell Munoz helps his stepsons Angel and Miguel Guzman get backpacks and supplies at Duggan Park Apartments back to school party. 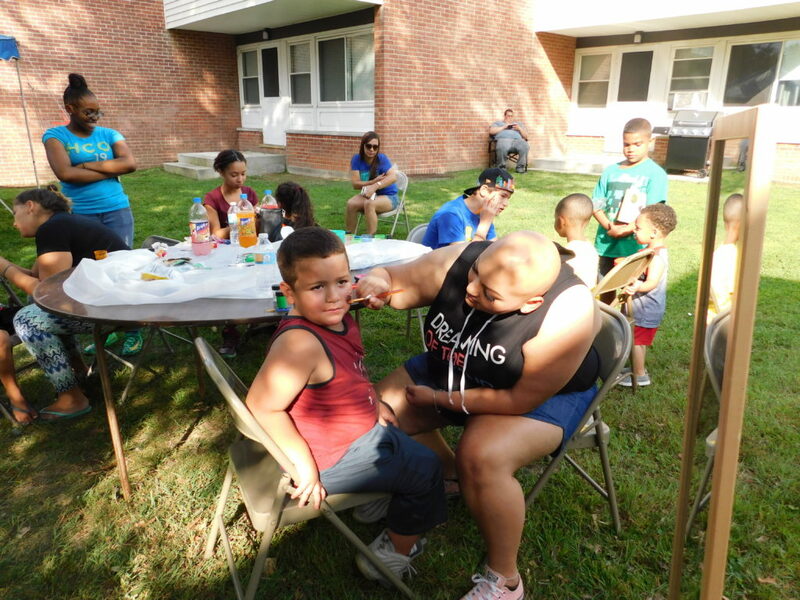 On a sunny August afternoon, the back-to-school event at Duggan also featured a cookout, dance music, face painting, and even a jump roap session outside the T/R/S! office at the family development in the Indian Orchard section of the city. Parents agreed that T/R/S! at Duggan – it is the third SHA development to have the family-based literacy program – is going to be a good thing. 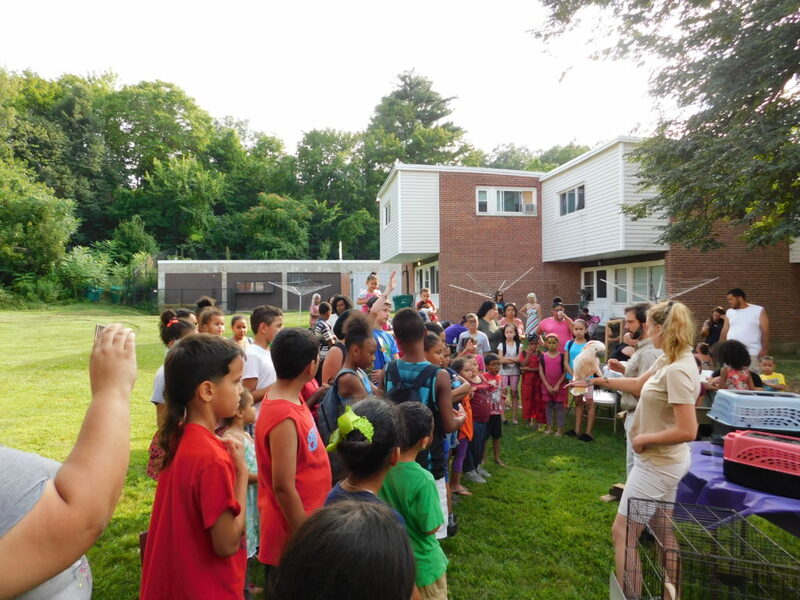 Children said the event was a fun way to get to know new neighbors and friends. Duggan Park Apartments residents celebrate the new Talk/Read/Succeed! 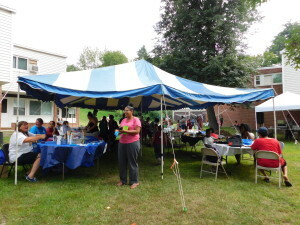 program at a back-to-school cookout. “I am very interested in this program,” said mother of two Yaneth Rivera, who took the time to register her family for T/R/S! as she enjoyed the music, entertainment, and food. “It looks really great, and everything I’ve been hearing about it is great,” she said. T/R/S!, a family-based early literacy program, is in its eighth year at two SHA developemtns, Robinson Gardens and Sullivan Apartments, and their feeder elementary schools, Dorman and Boland. This summer, Duggan Park and Indian Orchard Elementary School launched a partnership along with other community partners, including the Springfield School Department and the City Library, Head Start, the Eric Carle Museum, and Behavioral Health Network. 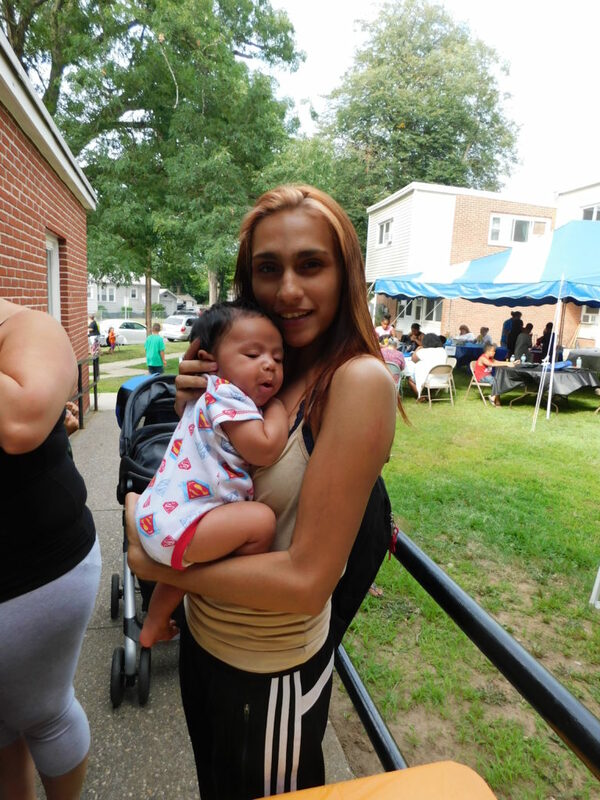 Yaneth Rivera holds her new baby Elijah, at Duggan Park Apartments. Daisy Gomez is the T/R/S! outreach coordinator at Duggan, and is busy lining up programs and events that will help support families, with an ultimate goal of financial independence. On tap for the fall will include nutrition classes, a job club, and events that bring parents and children together for fun and enlightenment. Duggan is the largest of the three T/R/S! developments, with 196 families, including 450 children. 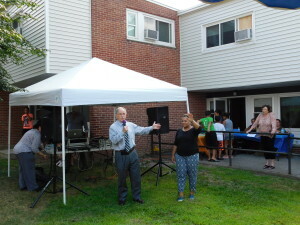 Springfield Housing Authority Executive Director William Abrashkin and T/R/S! Outreach Coordinator Daisy Gomez greet the crowd at Duggan Park Apartments. The open house ran on a sunny summer day, with families gathered out behind the T/R/S! center at 435 Goodwn St.
SHA Executive Director William Abrashkin was on hand to welcome families to the celebration, and to the programming that will follow soon. Savannah Marcotte, executive outreach coordinator at Forest Park’s Zoo on the Go, shows Duggan Park residents a Madagascar hissing cockroach. Partners and vendors worked at tables where books, writing materials and even jump ropes were passed out to children, and information was given to parents. “Our goal is to promote literacy and to let families know we’re here,” said David Feinstein, literary educator at the Amherst-based Eric Carle Museum. He ran a roulette wheel that rewarded winners with books, stickers, pencils and more. 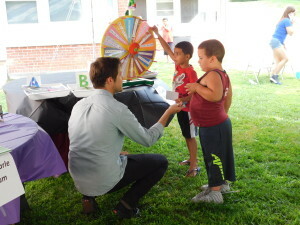 David Feinstein, literary educator at the Eric Carle Museum, with two young residents of Duggan Park Apartments at the roulette wheel. 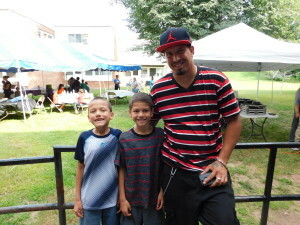 Other vendors included Boston Medical Center, Head Start and the Adult Literacy Program at SHA. Parents agreed that they have high hopes for the program. Mother of four Yvonne Bernadeau has lived at Duggan 10 years, and loves the idea of a partnership that will include schools and home. Yvette Bergendale paints the face of Carlos Ortiz. Both live at Duggan Park Apartments. Merary Espada is the mother of five young children, and has already forged ties with Gomez and the new T/R/S! center. The afternoon also featured a visit by the Forest Park Zoo on the Go, with Educator Ben Stafford and Outreach Coordinator Savannah Marcotte showing and explaining a roster of animals, including Apollo, a Moroccan cockatoo, three Madagascar hissing cockroaches, and two African pigmy hedgehogs. 607 days ago / Talk/Read/Succeed!